These edible wild plants pop up from under the leaf mold even before the snow has receded. These are some of the earliest wild edibles to forage in spring. So grab your willow basket, your foraging knife, and a couple handy field guides. You’ll love this early spring walk in the wild and you’ll come home with dinner. And don’t forget to bring your children along for the hike. Foraging for early spring wild edible plants is one of the happy memories our children took into adulthood. Dandelion green salads were “weird” in the 1980s. Now they are haute cuisine. Morel mushrooms were one of the things we hunted for, found, but in those early days we were afraid to actually taste them. Can you imagine? We washed, sliced, and fried in butter those hollow morel mushrooms and then just stared at the cast iron frying pan on the table. The chickens really enjoyed them. Sad, I know. Today it’s a totally different story. 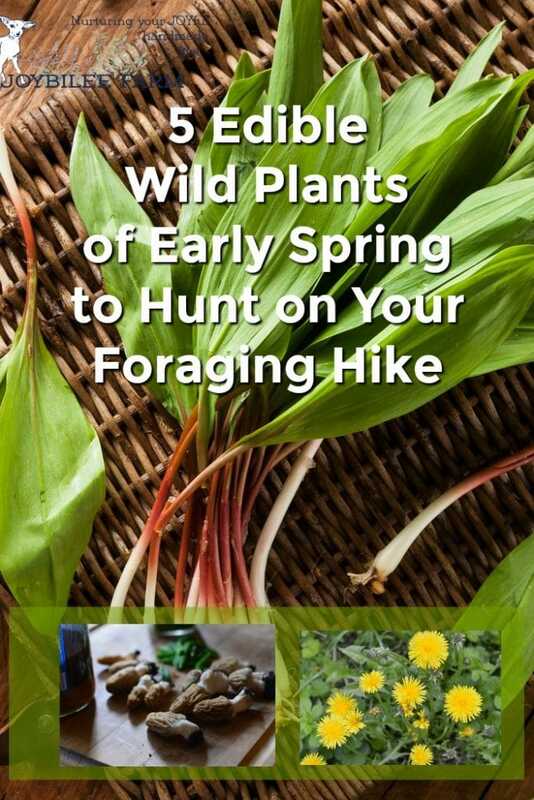 Those adult children that hiked and found morels, dandelion greens, wild ginger, and wild mustard are now confident and astute foragers. They are the inspiration for my love of wild herbs, edible wild plants, and edible wild mushrooms. Foraging wild edibles with the seasons is a valuable gift you can give your children, your neighbors, and yourself. It’s one of those skills that keeps on giving to your own family, and to your grandchildren and great grand children. 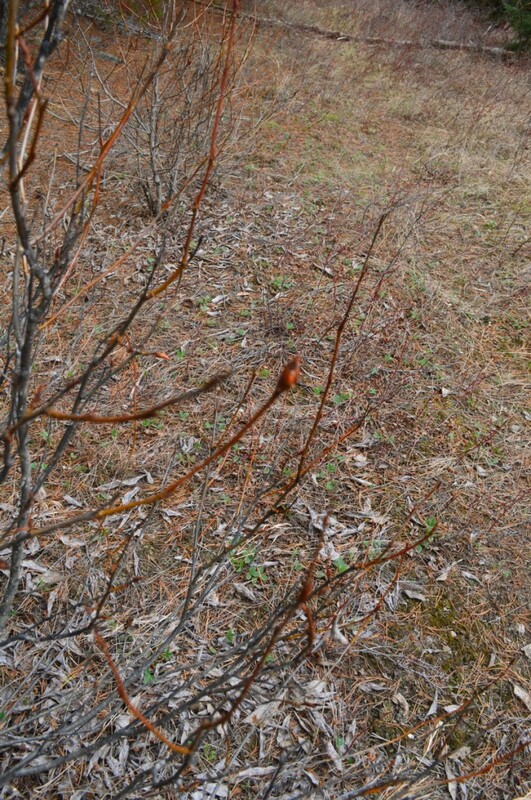 Almost as soon as the ground shakes off its winter clothes the green plants and mushrooms appear in earnest. The season is short for early spring edible wild plants but exciting. If you are ready for it with basket, harvesting knife, and a quiet afternoon, you’ll bring home a feast that many gourmets will be envious of. Ramps harvested with the root. It’s far better to cut these with sharp scissors leaving the root and the white part of the stem in the ground to continue growing. 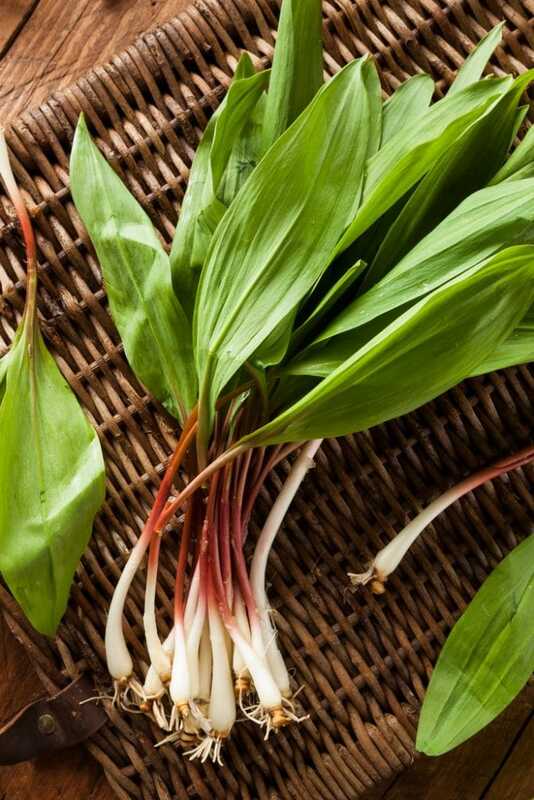 Ramps are one of the earliest wild edible to emerge in the spring. While they don’t grow in my area, those of you in the east will find wild onions, wild leeks, and wild garlic in the shady places from Georgia to Canada. Do a favor to the next generation and harvest only the tops, leaving the roots in the ground to regrow, to ensure a long life for the patch. Note that these plants are endangered and it is illegal in some areas to transport them across state lines. So know the laws in your area before you forage them. If they grow well in your area, and you can spare a shady garden spot, plant ramp seeds and get them growing permanently in your own yard. You can find seeds here at Richter’s Herbs for ramps and ramsons (wild garlic). By planting them in your yard you can ensure the survival of the species for future years. Once you get them home, wash the leaves, then chop them and fry them for a rich garlicky aroma and flavor. Ramps are good with eggs, potatoes, or pickled. 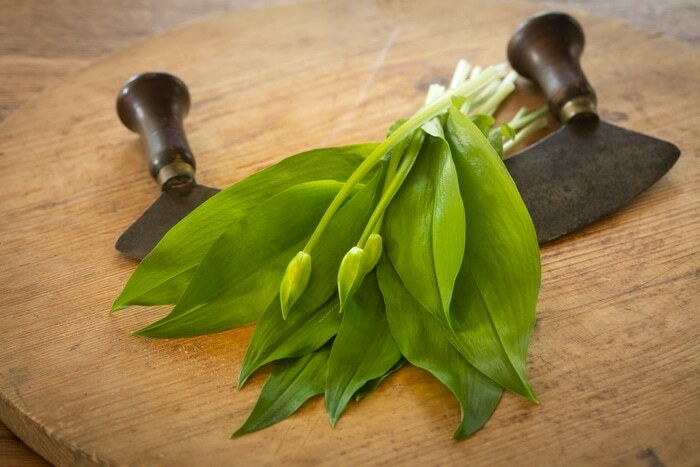 If you don’t have ramps growing near you, you can substitute wild garlic or ramsons. Chives, green onions, and garlic scapes can all be used in similar ways. Dandelions will start to emerge even before the snow is fully melted. They are welcome spring greens rich in blood strengthening minerals and salts like calcium and potassium. In early spring dandelion greens are mild flavored and can be eaten raw in salad or made into dandelion pesto. Use the unopened blossoms in fritters or salads. 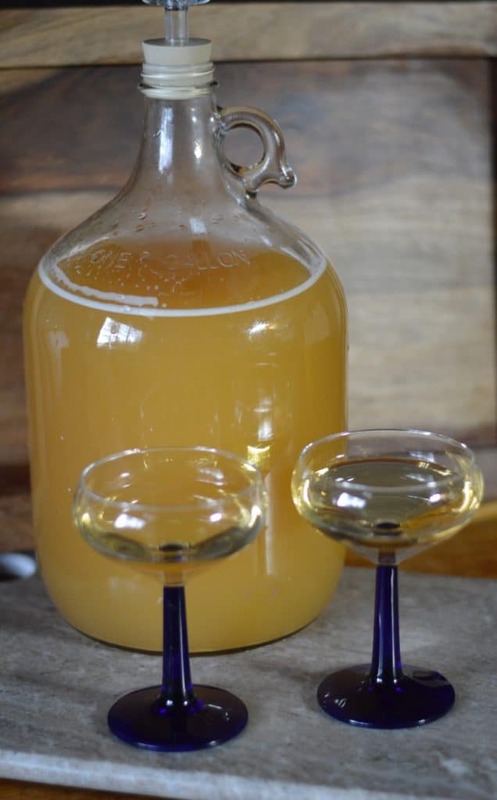 Add the open blossoms to mead or dandelion wine. Some folks when they make wine or mead insist on removing all the green calyxes and only using the sweet petals in their dandelion wine. I’ve tried it with and without the green calyxes and I haven’t noticed any bitterness when leaving the calyxes on. Maybe I just have more mild tasting dandelions in British Columbia. So if you want to try making dandelion wine I’ll leave it up to you whether you want to go to the extra work of just using the petals. I use the whole flower including the green parts. I know someone will tell me to leave the yellow dandelion flowers for the bees but you know, I’ve never yet been able to harvest them all. Even when I go out daily with a basket to bring in the pretty yellow flowers, I never even get a third of the open flowers. And an hour later there’s even more of them. So provided you aren’t spraying poison on the dandelion flowers I don’t think you have to worry about taking too many. 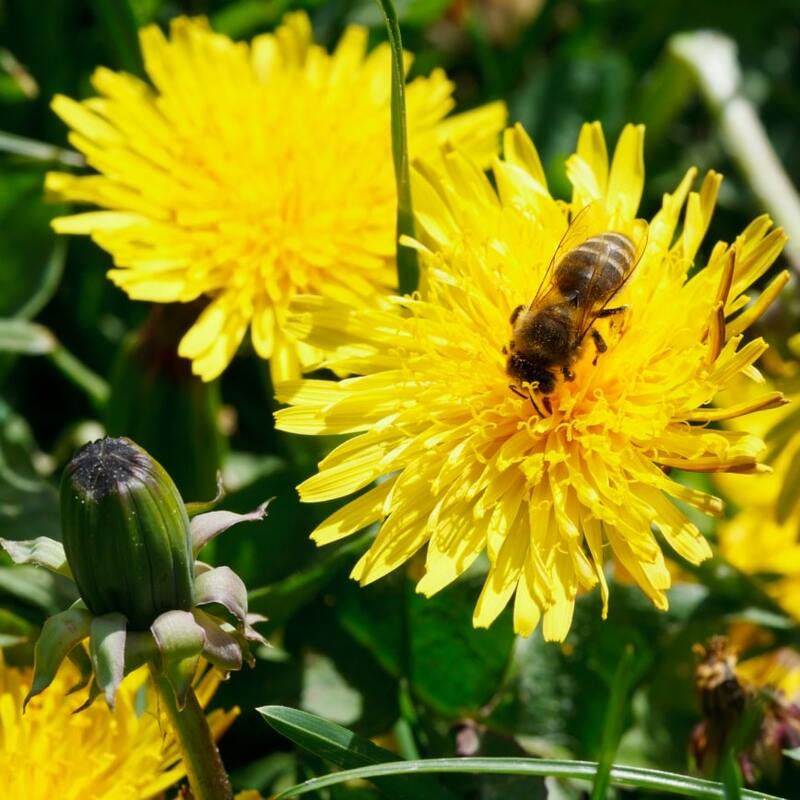 Dandelions are perennial and the more flowers you take the more the plant will send up flowers. And I want to let you in on a secret. This year I actually bought dandelion seed from Bakercreek seed. They have a variety of Italian dandelion that I want to compare to my native dandelion. It’s supposed to have larger leaves for salads. 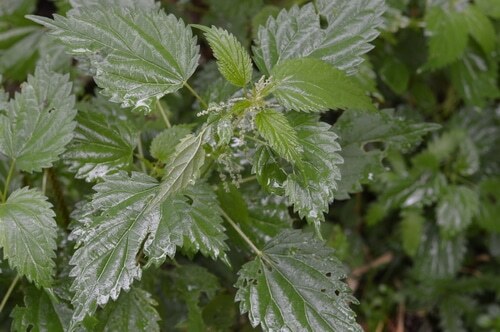 Another early spring green that’s rich in minerals and will help your body recover after the long winter is stinging nettles. You’ll find them coming up in shady, damp places even before the snow is entirely melted. Wear gloves to harvest the green tops and use scissors or pruning shears to protect your hands. When you get them into the kitchen swish the tops in a sink of cold water to remove any debris and grit. The tiny hairs tend to collect the grit from the forest floor. Steam them well before enjoying them. Steaming or simmering them in boiling water stops the sting. Don’t try these in a salad raw though. Serve them anyway that you would serve spinach. Nettle lasagna, pasta noodles, with feta cheese in Spanakopita are all good choices. Morels are one of the most desired mushrooms in the world. The morel crop favors burned areas, so if you’ve had a forest fire in your area in the recent past, you may find an increase in morels in the early spring. Morels start popping up when the soil temperature is 45 to 50 degrees, the daytime temperature reaches 60 degrees and night time temperatures stay around 40. Usually just after the maple syrup season finishes the morel season begins. You’ll need a good mushroom field guide and if you can take an experienced mushroom hunter with you, all the better. Here in BC we find aspen morels growing in the leaf litter under aspen and alder trees. 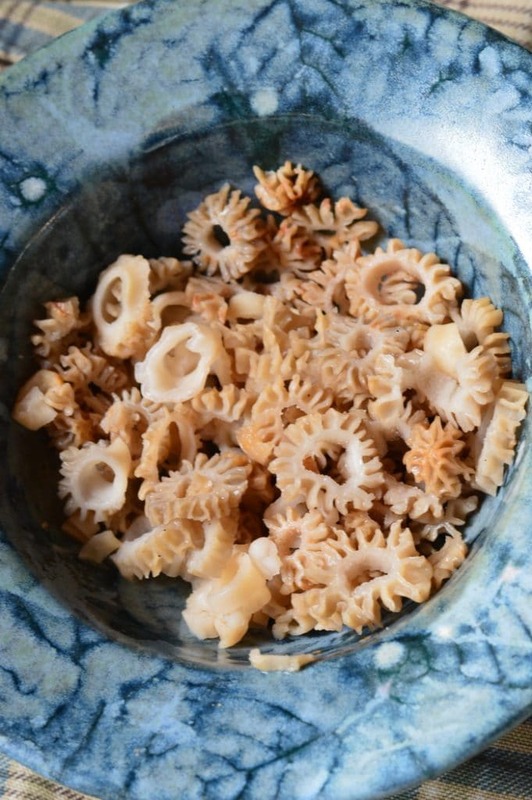 Your local morels might have different preferences, but your field guide will tell you. Morels are often found under elms, oak trees, ash, or black cherry. Once you’ve seen one you’ll find them everywhere. Check regularly in likely spots, as they seem to come up suddenly and then just as quickly they are gone. 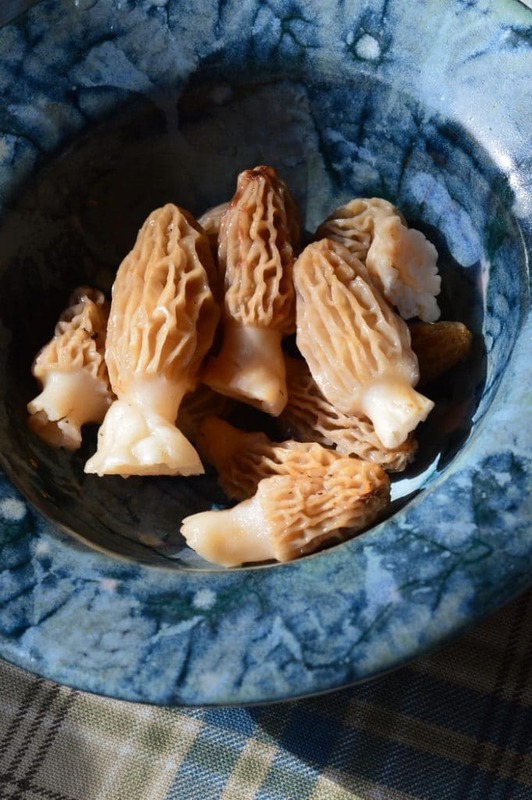 The morel season only lasts a few weeks, so you’ll want to be ready for it. I heard rumors that California is already harvesting morels. 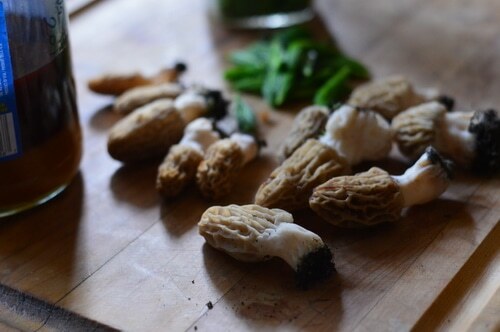 Morels are hollow stalked and they are best cooked well in butter with garlicky ramps or chives. Always be cautious when eating edible mushrooms. Be absolutely sure of the ID, and only eat a small amount the first time you try it to avoid a reaction. 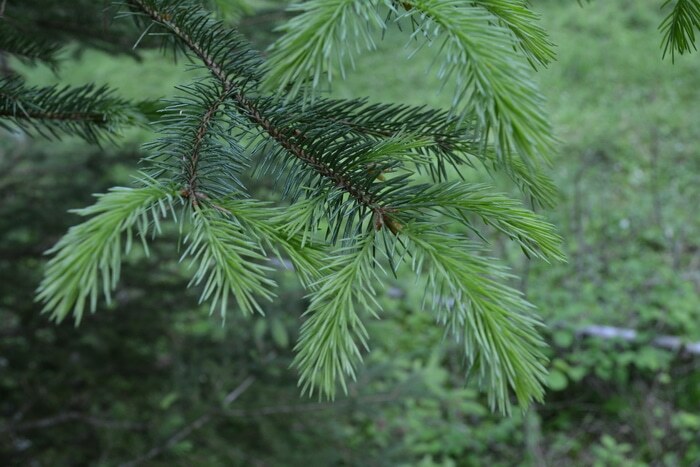 The lime green growing tips from the spruce trees can be harvested anytime from early spring until midsummer. The flavor is citrusy in early spring, maturing to a more resinous but still citrusy flavor in mid-summer. The tips can be candied, fried, and infused in vinegar, wine, or vodka. They are so good you won’t want to miss them. The Herbal Academy has a brand new online foraging course with a strong botany component that’s starting soon, just in time to guide you through spring foraging. The Herbal Academy is giving away a free course to one lucky person. If you’d like to enter the draw you can do so here.